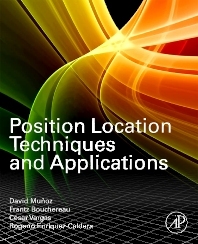 This book is the definitive guide to the techniques and applications of position location, covering both terrestrial and satellite systems. It gives all the techniques, theoretical models, and algorithms that engineers need to improve their current location schemes and to develop future location algorithms and systems. Comprehensive coverage is given to system design trade-offs, complexity issues, and the design of efficient positioning algorithms to enable the creation of high-performance location positioning systems. Traditional methods are also reexamined in the context of the challenges posed by reconfigurable and multihop networks. Applications discussed include wireless networks (WiFi, ZigBee, UMTS, and DVB networks), cognitive radio, sensor networks and multihop networks. David Muñoz is Director and César Vargas is a member of the Center for Electronics and Telecommunications, Tecnológico de Monterrey, Mexico. Frantz Bouchereau is a senior communications software developer at The MathWorks Inc. in Natick, MA. Rogerio Enríquez-Caldera is at Instituto Nacional de Atrofisica, Optica y Electronica (INAOE), Puebla, Mexico.